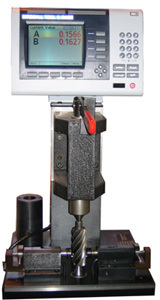 Birdsall Tool & Gage can help with design of gaging systems and tooling requirements. We place over 40 years of non-production manufacturing experience into the design and development process to insure that the product that you need designed exhibits reliability, durability, and maintainability. We build-to-print or design & build dial/digital indicator or electronic fixture gages, concentricity gages, dimensional gages, gage masters, and hole location gages to check a wide range of features and/or feature sizes. We provide, upon request, concept drawings and sketches with all Design and Build Gage quotes. Precision and location are keys to a good gage. With our Moore Jig Grinders, and Precision Parker Surface Grinders, we are capable of manufacturing gages within +/-.00005″. Our Engineering Staff manages over $4,000,000 of gaging programs a year. Cooperative alliances with other gage builders enable us to provide the best price with the best functional product and most reliable delivery for our customers. Autocad 2011, and Cadkey V7.1. For larger projects, we have relationships with design and engineering firms who have delivered dependable quality designs on excellent gaging programs. Tool & Gage makers are involved in the conception and manufacturing stage reliability, durability, and maintainability of all designs. We can quote your designs and even give you budgetary pricing before you are ready to release purchase orders.